This post will guide you through resolving various S Voice problems on your Samsung Galaxy S4. Take notice that we included the possible causes as well as pre-requisites before the resolution is presented. It may or may not solve your problem but at least it is worth a try. · Voice range is fluctuating. · Loud background or ambient noise detected. · Speaking too softly or closely to the microphone. · Voice control/command is not enabled. · You are not connected to the network. · The app is not compatible with your device. 1. Verify the microphone is free of any obstructions such as a case or cover. 2. Ensure you are in a relatively quiet area. Background noise can be detected by the microphone and may interfere with the device recognizing your voice. 3. Verify the device has no physical or liquid damage (for example, has not been dropped or exposed to moisture). 4. Check for any available software updates for your device at Samsung Support. 5. Verify you have an active connection to the network. 6. Verify the application is compatible with your device and your device's software. 1. From the Home screen, touch Apps > S Voice . 2. Hold the device roughly 11in-20in (30cm-50cm) away from your face. 3. 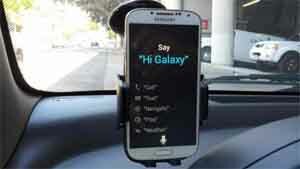 Say "Hi Galaxy," your preset command, or touch S Voice to wake up S Voice. 4. Speak in a clear and concise tone.